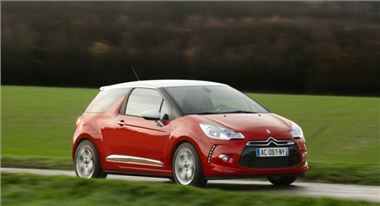 Buyers of Citroen’s stunning DS3 can look forward to excellent residual values, according to latest figures. Industry analysts CAP predict that after three years/60,000 miles a DS3 1.6 VTi 120bhp DStyle will be worth 43 per cent of its original value. That means a seller could expect to get £5825 in 2013 if they paid the list price of £13,700 today. At 43 per cent, it means that this version of the DS3 has the same residual value as the MINI Cooper 1.6-litre with Pepper Pack. Against the Alfa Romeo Mito 1.4TB Veloce and Abarth Grande Punto 1.4 Turbo, it performs even better. The Mito will be worth 37 per cent of its value after the same period, while the Grange Punto will be worth just 32 per cent. In a separate announcement, insurance groups have also been finalised. In the 50 Group system, the DS3 petrol DSign is 12, DStyle is 15 and the DSport is 22. Diesel Dstyle is 15, while the diesel DSport is 18. So what’s the DS3 like? Click here to read what we thought when we got behind the wheel ahead of the car’s launch in the UK on 15 February.